Planning a party or gearing up to watch some basketball? Everything seems to go better with food. 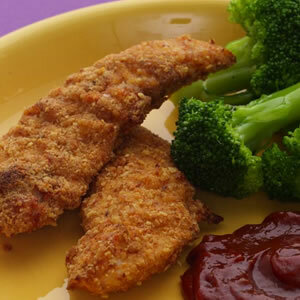 It is possible to have delicious and healthy finger foods that you and your guests will love. We have put together 11 quick and healthy recipes that are sure to please even the most discriminating snack connoisseur. 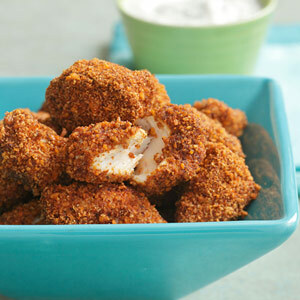 These spicy and crunchy pecan-crusted chicken nuggets are paired with a quick, creamy ranch dip. If you can’t find coarse breadcrumbs, substitute Grape-Nuts cereal instead. Per serving: 291 calories; 16g carbohydrates; 14g fat (2g saturated, 6g monounsaturated); 27g protein; 3g fiber; 2g sugar; 339mg potassium; 379mg sodium. Per serving: 199 calories; 30g carbohydrates; 8g fat (1g saturated, 2g monounsaturated); 5g protein; 4g fiber; 1g sugar; 273mg potassium; 452mg sodium. 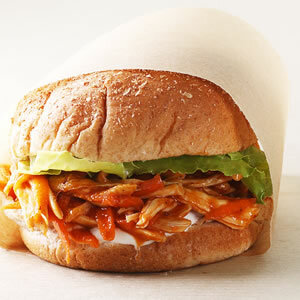 Combine chicken, carrots and barbecue sauce in a bowl. Per serving: 324 calories; 39g carbohydrates; 7g fat (2g saturated, 2g monounsaturated); 26g protein; 4g fiber; 14g sugar; 488mg potassium; 657mg sodium. Nutrition Bonus: Vitamin A (100% daily value), Selenium (56% dv). Per serving: 323 calories; 33g carbohydrates; 13g fat (4g saturated, 7g monounsaturated); 15g protein; 3g fiber; 2g sugar; 241mg potassium; 511mg sodium. Per serving: 184 calories; 4g carbohydrates; 7g fat (1g saturated, 3g monounsaturated); 26g protein; 1g fiber; 0g sugar; 264mg potassium; 147mg sodium. The classic flavors of Chicken Cordon Bleu—ham, Swiss cheese and thyme—inspired this easy chicken burger. We like using regular ground chicken, which is a blend of thigh and drumstick meat, to help keep this burger juicy, but feel free to use 100% ground chicken breast if you’d like a leaner burger. You’ll cut 20 calories and 1 gram saturated fat. 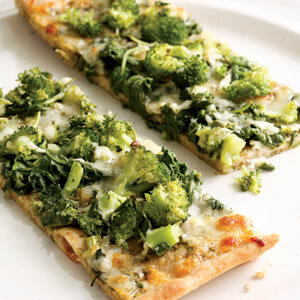 Serve with roasted broccoli. Preheat grill to medium-high (or see Stovetop Variation). Combine mayonnaise, mustard, 1 tablespoon shallot and 1/2 teaspoon thyme in a small bowl. Set aside. Place the remaining 4 tablespoons shallot, remaining 1 teaspoon thyme, chicken, ham, salt and pepper in a medium bowl. Gently combine without overmixing. Form into 4 patties, about 3/4 inch thick. Oil the grill rack (see Tip). Grill the burgers, turning once, until an instant-read thermometer inserted in the center registers 165°F, 4 to 5 minutes per side. Top each burger with cheese and cook until melted, 1 to 2 minutes. 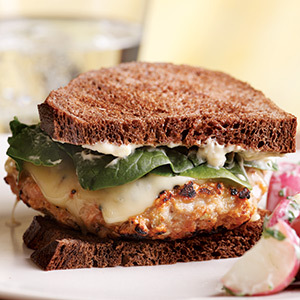 Assemble the burgers on toasted bread with the herb mayonnaise and spinach. Make Ahead Tip: Prepare herb mayonnaise (Step 2) and refrigerate for up to 1 day. Stovetop Variation: Coat a nonstick pan, preferably cast-iron (or a grill pan), with cooking spray and heat over medium-high heat for 1 to 2 minutes. Add burgers, reduce heat to medium and cook, turning once, until an instant-read thermometer registers 155°F (for pork and bison) or 165° (for beef or chicken), 4 to 5 minutes per side. Per serving: 350 calories; 20g carbohydrates; 17g fat (6g saturated, 6g monounsaturated); 29g protein; 3g fiber; 1g sugar; 910mg potassium; 722mg sodium. Nutrition Bonus: Vitamin A (63% daily value), Potassium (26% dv), Folate (25% dv), Vitamin C (23% dv), Zinc (21% dv), Calcium & Magnesium (18% dv), Iron (16% dv). 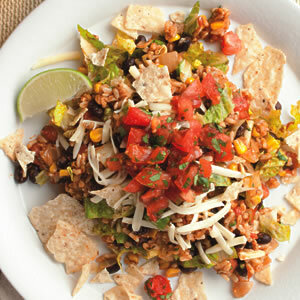 Nobody will miss the meat in this colorful, zesty vegetarian taco salad. 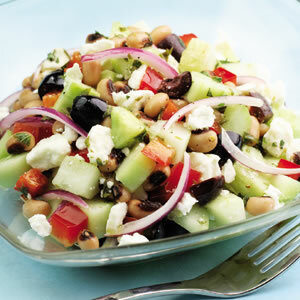 The rice and bean mixture can be made ahead and the salad quickly assembled at mealtime. Kitchen Tips: To remove corn kernels from the cob, stand an ear of corn on its stem end and slice the kernels off with a sharp knife. To cook rice, bring 1 cup water and 1/2 cup long-grain brown rice to a boil in a small saucepan. Reduce heat to low, cover, and simmer at the lowest bubble until the water is absorbed and the rice is tender, about 40 minutes. Remove from the heat and let stand, covered, for 10 minutes. Makes 1 1/2 cups. Per serving: 395 calories; 52g carbohydrates; 17g fat (5g saturated, 5g monounsaturated); 14g protein; 9g fiber; 10g sugar; 774mg potassium; 459mg sodium. Nutrition Bonus: Vitamin A & Vitamin C (38% daily value), Calcium & Folate (23% dv), Potassium (22% dv), Magnesium (21% dv), Calcium (23% dv), Iron (15% dv). Lean ground beef combined with whole-grain bulgur, egg noodles and a creamy tomato sauce in a baked casserole topped with Cheddar. 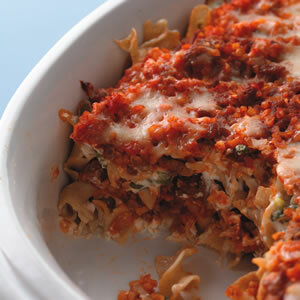 With less fat and calories than the original skillet meal, this dish is sure to become a new family favorite. Wipe out the pan, add oil and reduce heat to medium-low. Add bulgur, garlic and the reserved scallion whites. Cook, stirring, until the scallions soften, 5 to 7 minutes. Add tomato sauce, water and the beef; bring to a simmer. Cover and simmer gently until the bulgur is tender and the sauce is thickened, 15 to 20 minutes. Season with 1/8 teaspoon salt and pepper. Puree cottage cheese in a food processor until smooth. Transfer to a medium bowl; fold in sour cream and the reserved scallion greens. Season with the remaining 1/8 teaspoon salt and pepper. Per serving: 371 calories; 39g carbohydrates; 14g fat (7g saturated, 4g monounsaturated); 22g protein; 5g fiber; 6g sugar; 631mg potassium; 757mg sodium. Nutrition Bonus: Calcium, Iron & Vitamin C (20% daily value), Magnesium (17% dv), Vitamin A (15% dv). Spread steak out in the pan and cook until seared on one side, about 1 minute. Add garlic, jalapeno and ginger and cook, stirring, until fragrant, about 30 seconds. Add bean sprouts and spinach (the pan will be very full). 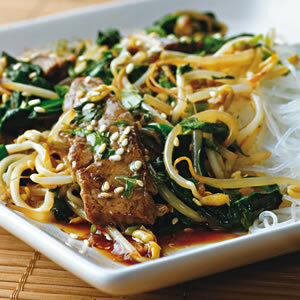 Pour the mirin mixture into the pan and stir gently until the sauce thickens and the spinach is wilted, about 3 minutes. Stir in cilantro and sesame oil. Serve topped with sesame seeds (if using). Tips: If you have a little extra time before dinner, put the steak in the freezer for about 20 minutes to help make it easier to slice thinly. Per serving: 410 calories; 28g carbohydrates; 17g fat (4g saturated, 8g monounsaturated); 35g protein; 6g fiber; 16g sugar; 1237mg potassium; 680mg sodium. Nutrition Bonus: Vitamin A (160% daily value), Vitamin C (90% dv), Folate (75% dv), Iron (35% dv), Potassium (32% dv). Per serving: 161 calories; 12g carbohydrates; 10g fat (3g saturated, 6g monounsaturated); 5g protein; 3g fiber; 3g sugar; 273mg potassium; 270mg sodium. 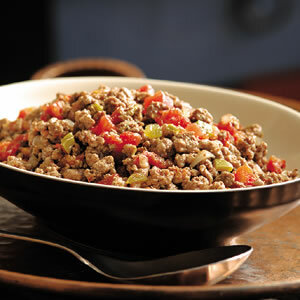 A combination of lean ground beef and ultra-lean ground turkey breast makes a less-greasy filling. Bypass taco-seasoning packets in favor of making your own full-flavored filling. Place beef, turkey and onion in a large nonstick skillet over medium heat. Cook, breaking up the meat with a wooden spoon, until cooked through, about 10 minutes. Transfer to a colander to drain off fat. Return the meat to the pan and add tomatoes, cumin, ground chipotle (or chili powder) and oregano. Cook over medium heat, stirring occasionally, until most of the liquid has evaporated, 3 to 6 minutes. 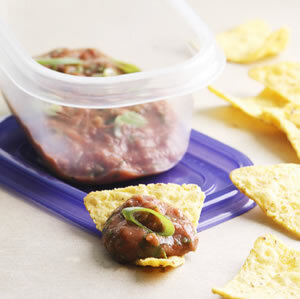 Make Ahead Tip: Cover and refrigerate for up to 1 day. Reheat just before serving. Tip: Look for Rotel brand diced tomatoes with green chiles—original or mild, depending on your spice preference—and set the heat level with either ground chipotle chile (adds smoky heat) or chili powder (adds rich chili taste without extra spice). Per serving: 98 calories; 3g carbohydrates; 2g fat (1g saturated, 1g monounsaturated); 17g protein; 1g fiber; 2g sugar; 26mg potassium; 243mg sodium.